For the ultimate in golf course selection, DDA designed, programmed, and developed a Golf Course Fitting System for P3 Designs using 3D animation and custom graphic design. Golfers have many factors to consider when searching for the perfect golf course. Course style, layout, length, difficulty, and sand and water features all have an effect on a golfer's game. 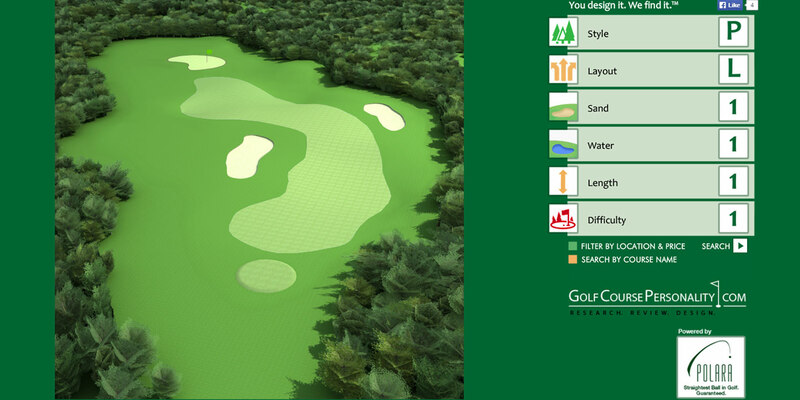 With so many factors to choose from, there needed to be an easy way for users to search for the perfect course to fit their golfing needs. Not only does this search tool need to be user-friendly, engaging, and pleasing to the eye, it needs to include a comprehensive list of courses around the country for users to choose from, whether they're searching by personal preference, location, or price. The objectives for the project included producing animated golf courses with five different environments, nine different water and sand variations, and utilizing three different course layouts, lengths and levels of difficulty. Each 3D animated graphic needs to adjust dynamically when the user manipulates a slider, making for both a functional and user-friendly presentation. The back-end database would need to include all golf course contact information along with matching course characteristics, all the while being easy to update. Course search results must reflect the best course option that fits a user's personal preference based on a variety of features, location, and/or price range. Finally, the entire tool needs to be housed in an appealing graphic user interface (GUI) for both the user and administrator. After discussing all golf course styles and features, DDA designers and 3D animators modeled courses to match the client's specifications. DDA programmers implemented a large database of courses from across the country as the backend of this search tool, allowing a user to choose specific course styles and features and search for a course that best fit the specifications. The search results also show a graphic on how well a particular course fits the user's specifications. DDA built a graphic user interface to house the search tool, and used Flash animation to incorporate everything from the dynamic menu, courses and search results to the moving water and flag effects. DDA was able to accomplish all of the above utilizing the in-house professional 3D computer animation studio, and DDA's database programming services. All golf courses were made from scratch by DDA animators. Every sand trap, water feature, and tree was custom designed by DDA and incrementally approved by the client, so the end result fit P3 Design's specifications to a tee.